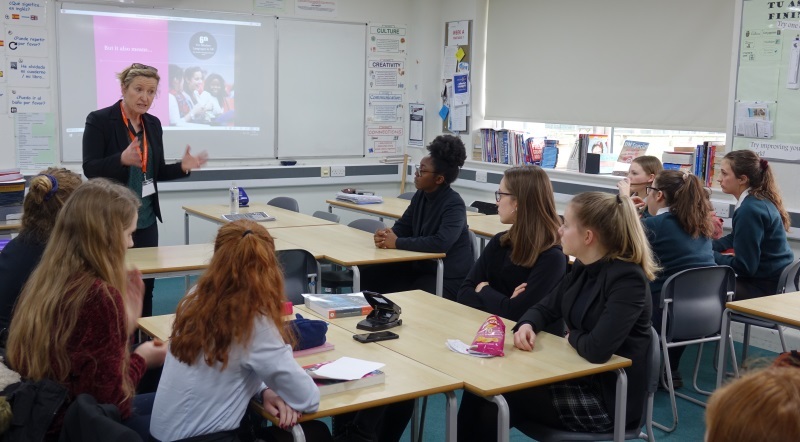 Dr Siobhán McIlvanney, Head of French at King’s College London, visited to talk to students about studying languages at university. Her visit forms part of a series of sessions open to both Y11 and Y12 that provides insight into studying languages at university. It includes visits from university lecturers, school Alumni and staff who have completed language degrees at university as well as practical advice on how to choose a course. The series covers not only the syllabus and joint degrees, but the wider experience of pursuing languages at university and the opportunities provided by studying abroad. “It’s definitely given me more confidence to do languages at university and encouraged me to apply to King’s, something I’ve been thinking about but not had the confidence to commit to.” Emily. “Her presentation was incredibly informative and engaging, especially with regards to the various modules that are available. It was lovely to hear from someone who is so passionate about her field and speaks from such a highly respected position at a top university” Luke.